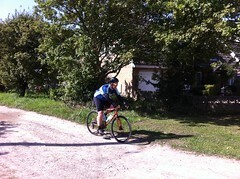 Steve Clarke puts the Light Blue Robinson through its paces at the Hackney GT Tour of the Cornfields on/off road sportive. It was a beautiful, sunny early Autumn morning and an ideal day to take The Light Blue Robinson Rival 1x out for a spin. Light Blue Brand Manager Steve Clarke chose the Hackney GT Tour of the Cornfields, an off road/on road sportive and it turned out to be a great day awheel. 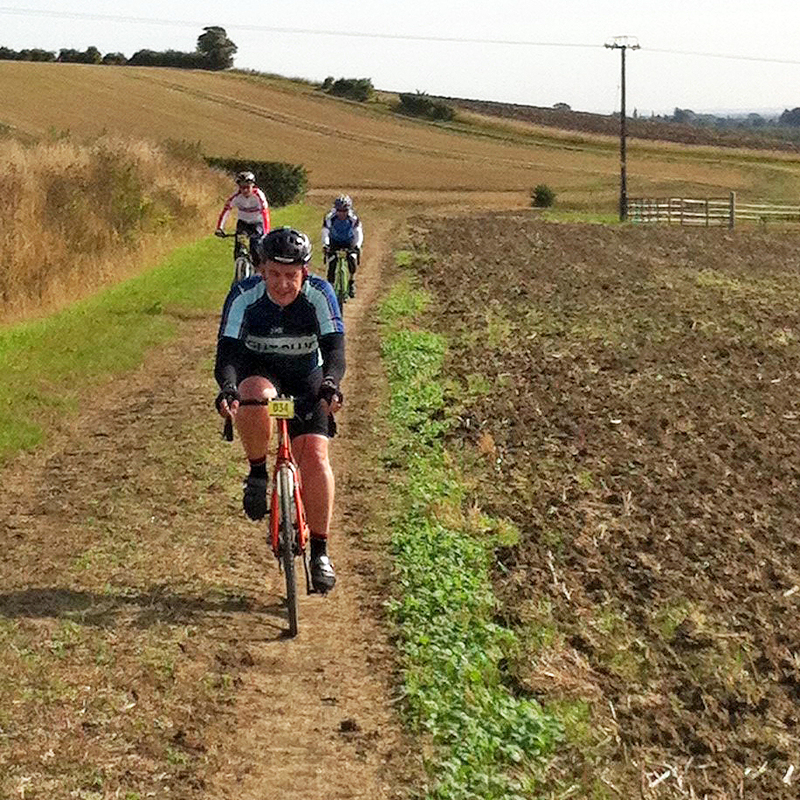 The route took in the leafy lanes and bridleways of South Cambridgeshire and North Hertfordshire and Steve and his wife Lindsay, along with Halo Wheels’ Matt Askham opted for the 100km route and an 8am start. Heading out from the National Trust’s Wimpole Hall, the Robinson, built in a ‘Gravel’ spec was soon in its element, with a short climb and then straight onto a grassy bridleway. No problems for the bike, it proved to handle just as well off road as it does on road. Unfortunately, Steve and Lindsay got stuck behind a rider on some single track and Matt disappeared into the distance, never to be seen again! Once back on the road, it wasn’t long before the intrepid duo managed to go off course (the signs could have been a little better). Thankfully Steve had printed out a basic route map and they got back on course and were soon off road again. Bumping down the side of newly ploughed fields, grassy paths and gravelly tracks, the Robinson was more than capable, even if the pilot was short on fitness! The long track from Kingston across the A1198 to East Hatley had everything and it was great to have a long traffic free, off road stretch, away from civilisation, as it were. It wasn’t all flat either, with a little climbing and descending thrown in. The only downside was the tractor tyred, rutted trail, which was like riding over corrugated iron at times. On to Croydon and Wrestlingworth before ending up at St Mary’s Church Hall in Potton for a feed stop. The Lee Valley Youth Cycling Club provided tea, cake and bananas to replenish fuel stocks and a chance for a brief sit down at the 45km point. Then it was onwards for the second half and through the villages of Sutton and Dunton, zig zagging from quiet country lanes to more grassy bridleways to Ashwell. Out of the village and it was onto a long byway that took you past the back of the CC Ashwell Grass Track field and maybe three miles to the outskirts of Littlington. At this point Steve was flagging a bit, so despite the sunshine, decided to head back to the HQ at Wimpole instead of doing the full route. The remainder of the ride was therefore on the road heading back through Abington Piggots, Shingay and Wendy to the B1042, followed by a 10% climb for a short way before turning right to Croydon and Arrington, then virtually straight over and into the back of the Wimpole Estate. “It was a real nice day in the saddle; the route was great, the countryside was beautiful and barely a car was seen all day. South Cambridgeshire/Hertfordshire might not be the most mountainous of areas, but 100km or 80 in our case, mostly off road, was certainly tough enough. The Robinson, in the ‘Gravel’ build of SRAM Rival 1x performed well. Handling was predictable, either on the road or trail. The Reynolds 725 frameset took the sting out of the bumps reasonably well (considering how bumpy it was) and the geometry provided day long comfort in the saddle.